It’s finally here! 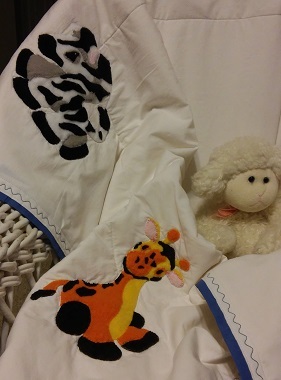 The zoo baby quilt…Not the baby! But he’ll be here soon! This was an easy quilt to make and the stencils are all free here for you to print so you can get started now. Oh! You will need fabric! Here’s how it’s done. The stencils have multiple layers and the layers are used just like a sewing pattern. You see, normally the enclosed areas of a stencil are cut out to make openings for paint. These are called “islands.” The paper left which blocks paint from reaching the surface and holds the stencil together are called “bridges.” Think of each layer as a normal sewing pattern and cut the islands out in the color or pattern of fabric for your design. Each zoo baby stencil has a title page or guide that shows the picture (much like an image from a coloring book). This will help you put the fabrics pieces in place and sew them on to create appliques. It’s also a great guide for deciding on the fabric color or pattern you want for your applique. When all four zoo baby stencil appliques are finished, make your quilt with two pieces of white cotton cut to the size of your choice. I used a white sheet and just folded it in half. I find sheets are a great choice because the high thread counts make for a soft blankie and for the price you just can’t beat it! I ran a ribbon of blue cotton around the perimeter and then finished it with a wave pattern on my sewing machine. 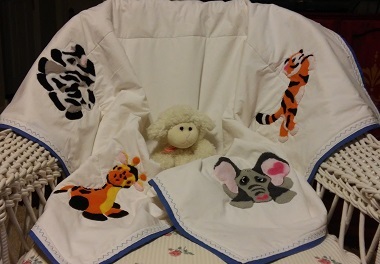 I sewed each of the four zoo baby stencil appliques in a corner and then ran a stitch line between appliques. Ok! You need the patterns, right? The first place to start is Using Multi-Layer Stencils to Create Appliques (which is where you will find the baby zebra – Enjoy!). This page also adds some more details about creating the appliques including an in depth description of the stencil overlays. The next step in this project is Using Multi-Layer Stencils for Quilting! Where you’ll find the giraffe baby stencil applique for quilting pattern. Then move on to Making A Baby Elephant Applique With A Stencil! Each article adds some hints and tips so take your time and explore! 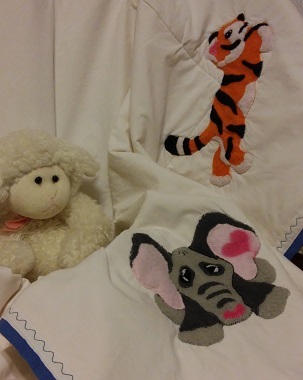 Making A Baby Tiger Applique With A Stencil is the last but certainly not least zoo baby. He’s one of my favorites with his bouncy playfulness. Well, I hope you enjoy this project and share with us when you finish. I find that when something is hand done even though we might us the exact same pattern the end results are all very different and that is what makes “home made” so wonderful!